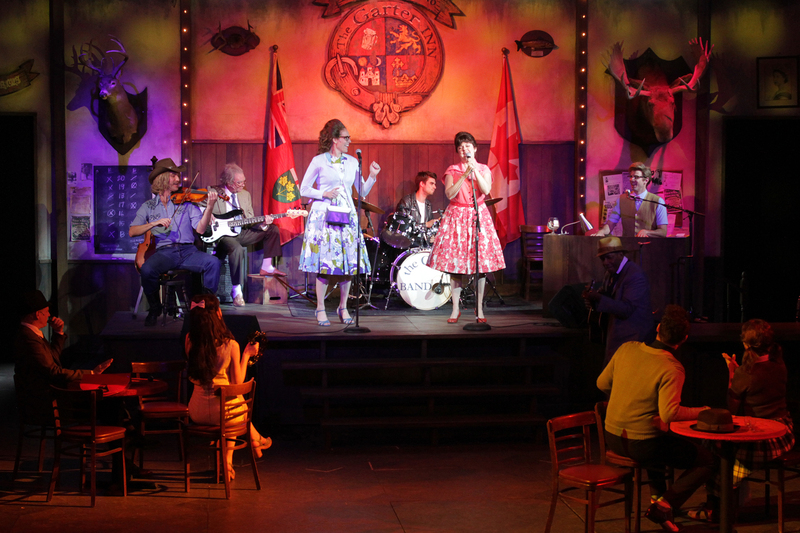 “These Boots are Made for Walking” fills the Bard on the Beach mainstage tent as a colourfully dressed cast takes the stage of The Garter Inn in 1960s Windsor, Ontario. At this moment I wondered what a modern day song like this was doing in a Shakespeare play, and whether these kinds of modern renditions that mix the old and the new are even appropriate. I think it depends. In this case, director Johnna Wright successfully translated the play to 1960s Ontario where it feels right at home, and then from the smaller Bard stage where it first appeared in 2012 to the larger space where it easily fills it with mirth and song. The casting for this production is brilliant and interestingly sees one actor reprising a role he played in Bard’s first ever Merry Wives production in 1994: Scott Bellis played Master Ford then and now, and he was splendid as he incredulously listens to Falstaff’s descriptions of his wife’s lust for the portly fellow. Ben Elliot returns as musical director, this time creating a soundscape of rousing country tunes that fit the tone of this rollicking story just right. Matching the brightness of the songs are the colourful, floral costumes and the inside of the Garter Inn full of interesting décor such as a moose head on the wall. Mistress Ford (Amber Lewis) and Mistress Page (Katey Wright) have a lot of fun as they fool Falstaff (Ashley Wright) into thinking that they are interested in him after he sends them identical letters professing his love. They find equal pleasure in letting Master Ford think his wife is unfaithful and teach him an important lesson in trust. They easily make fools of the two men and laugh along with the audience as they sit back in their lawn chairs and revel in their mischief. Easily the most fun and enjoyable show at Bard this year, this is the only play Shakespeare wrote set in England, and seems the most representative of his time and the people he may have known. Perhaps that’s why it feels immediately accessible; the story is simple, there are no intricate character lists to keep track of, and everyone has a great time fooling Falstaff, a favourite character then and now.